Disclosure: This post contains affiliate links. For more information please refer to my Disclosure Policy. Because of our kids’ special needs, teaching reading and writing has always been a challenge. We have experienced periods of advancement as well as regression. I had been intrigued by everything the Institute for Excellence in Writing (IEW) has to offer and was thrilled for the chance to review the Primary Arts of Language: Reading Complete Package and Primary Arts of Language: Writing Complete Package. What really impressed me even more about IEW is their heart for special learners. Seeing how their programs have helped special needs learners was really encouraging, and I couldn’t wait to jump in when we received our PAL packages! Before jumping in, though, I watched the included DVD-ROM’s, which I found extremely helpful in determining how to start, how to specifically use the teacher guides, how to set up the games, etc. They are long, so on the first day, I only watched the videos and proceeded to start with the program the next day. Although you could guess your way through without them, I highly recommend watching them because I feel like I was able to start quickly and seamlessly because of them. Plus, they contain the worksheets needed for the program. I chose to print out the full first set of worksheets right at that time so they would be readily available, though you could opt to print the worksheets as needed. The only downfall I see of the DVD-ROM is more and more new computers (particularly laptops and MAC computers) no longer have a DVD drive. My laptop does not, but luckily my husband’s computer does. There is an option to order the printed materials, though. The DVD-ROM’s also include bonus MP3’s. Although the Reading and Writing packages are separate packages, they are designed to fully complement each other. Each program has its own Teaching Manual, DVD-ROM, and materials, which I will discuss further in my review. In fact, when working on a schedule, a recommended schedule is included right off the bat in the PAL Reading Teacher’s Manual. The recommended schedule naturally works in the Writing program as well, and we even find we bounce back and forth between the two throughout the day. The suggested schedule also recommends suggested breaks, which are perfect for working on other subjects. I found this schedule worked really well for us, so I wrote it on our task board so I could easily refer to it rather than flipping to that page each time. We use the first break for Math and the second break for Art and/or Science, and it has really helped our day flow. Although our kids have really been enjoying PAL, breaking up reading and writing is good for them because they tire easily. We have been using PAL Reading and Writing with both our older children who are ages 9 and 7. Our 9 year old son is on the Autism Spectrum. He continues to struggle with learning to read and although is at the late 2nd Grade level for most subjects, he is reading at a 1st Grade level. He has fine motor delays, so writing is also a challenge. His hands get tired easily, and writing just doesn’t come easily to him overall. Our 7 year old daughter has ADHD and Sensory Processing Disorder. Although she is starting to progress in reading, writing is still a big challenge as she also has fine motor delays. Holding the pencil correctly is her biggest challenge as she tends to hold it with her outer fingers. We find she does still struggle with writing letters backwards as well. Despite their ages and even their abilities at this point, we decided to start both the Reading and Writing at the very beginning. They definitely know their letters, but we chose to do this for two reasons. The first reason is that not starting at the beginning is a big hang-up for them – particularly our son. He has a hard time starting anywhere but the beginning. The other reason is that they both really need to correct their pencil grip, which is something you may have seen I resisted in the past. I was even told not to do it at one point (particularly with our daughter since she was writing well, just incorrectly), but when I really thought about it and read the importance of it, I realized this isn’t something we should let slip. I knew this was the time to get it right. 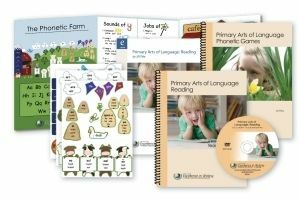 The benefit of having two Teacher’s Manuals (one for each program) is that you could start writing on the necessary level and reading on a different level. I love that this program makes that possible, and I think it’s the perfect solution for children who are further ahead in one subject or the other, but because of hang-ups and deciding you never can have too much practice, I just decided it was best for us to start both at the beginning. Poetry. (Reading) 5-10 minutes. In Poetry, we read a poem and then usually stop to pick out several “letter helpers.” This helps tie in what we will be learning later in the day, and the repetition has been very helpful in general. Class Journal. (Writing) 5-10 minutes. In our Class Journal, each child has their own journal (we just use a simple, spiral bound notebook), and we write the date at the top and write one sentence about our day (or weekend). At the beginning it’s noted that the parent writes the entry, but because our children are able to do copy work, I write it on the board and have them copy it to their journal, which is why I only have them write one sentence. I emphasize punctuation, and we read our previous entries. Priting/Copy Work. (Writing) 15 minutes. Because we are still in the beginning, our printing consists of individual letters. The letters are emphasized by their sound and not the letter name. Each letter has a unique name by which to remember it. Ex: K is the “kicking letter.” This has been a fun way to go over the letter sounds, and I found even our 5 year old likes to come over and learn the sounds! The kids practice writing the letters in their notebooks, though if your children aren’t writing at all yet, there are a myriad of suggestions for learning to write the letters. For our children, it’s more of a review, but writing them properly. Read a Story. (Writing) 20 minutes. I admit, I was surprised this is in the Writing program, but it offers a break from the writing and goes into detail about the Story Sequence. Story Sequence is something we’ve attempted but struggled with in the past, but in this program it’s introduced slowly, step-by-step, and although our kids do still struggle with the concepts, I can use the ideas to guide them and prompt them. We have seen major improvement in their fully understanding and even being able to tell the story back! This is a big accomplishment! Foundations and Reader Words. (Reading) 15 minutes. This is where I teach letters, phonics, and site words using games. All game boards and pieces are provided in the PAL: Phonetic Games book (included in the Reading Package). Game boards are generally cut out and pasted to file folders, which make them easy to store and easy to find and get out. Our kids like to do them independently as well, so it is great that they’re easily stored and found. Game pieces can simply be paper clipped to their game board. I simply cut out the needed game pieces the day they are needed, which means I have to allow for a little prep time before we begin our day, but it only takes a few minutes. The kids really enjoy the game style learning, and even our 5 year old has gotten in on the games and is better learning his letter sounds as well! He also has special needs, so I love this! Their favorite game so far is Mugs! They love feeding him bones while I say the letter sound! Phonetic Farm. The Phonetic Farm is included in the Foundations and Reader Words, but I wanted to give it a separate mention. It contains its own folder with a farm background and stickers. We find the sticker for the helper letters we learned that day and add them to the farm. Helper letters include letter combinations like “er,” “ee,” “ow,” “ck,” etc. They fit in to the farm by relating to that area. For example, the “ow” at the end of words like “yellow” and “grow” goes into the Silo, which will eventually contain all helper letters that make the long “o” sound. It’s really a unique and fun idea! Agenda or Work Period. (Reading) About 30 minutes. The Agenda or Work Period is where we use the worksheets we printed out from the DVD-ROM. It’s almost an independent work time, though I always stay close by to help. I use picture cards to show what they are expected to complete during the Agenda or Work Period and explain the instructions for any worksheets they will be doing. After they finish they put their worksheet in my “Teacher’s Mailbox.” I really like that this gives them independent work time and helps them to understand staying on task. The worksheets go along with what we’re learning that day. Phonetic Farm Tour. (Reading) 5 minutes. This is where we get back out the Phonetic Farm and go over all of the letter helpers we’ve learned so far. I encourage them to say the sounds and even read the words if they can. Read Words/Sentences. (Reading) 5 minutes. This activity varies between sometimes having them read one letter and thinking of ideas that start with that letter to reading pre-printed words/sentences. It is a nice review of what we’ve been learning. Informal Spelling Test. (Writing) 5 minutes. In the informal spelling test, I say the letter sound (eventually it will be words), and they write it down. It is recommended to have them write on the white board, but because writing letters is more of a review, we’ve been doing it on notebook paper. The PAL also includes the All About Spelling Basic Interactive Kit and All About Spelling Level 1. The All About Spelling can be started at any time, but if you are following the program specifically as it is laid out, it is introduced in Part II of the Writing Program, which is after Lesson 31. I was hoping to get an early start but because of the fact that our kids are working so hard on correcting their pencil grip, I wanted to follow the program exactly to give them time to work up to the spelling. The All About Spelling Level 1 includes the Teacher Manual and the Student Pack. The All About Spelling Basic Interactive Kit includes Letter Tiles, Magnets, and Divider Cards. It’s recommended to use a recipe box for the cards and a magnetic white board. Overall, I am so happy with the progress our children have been making since starting the Primary Arts of Language: Reading and Writing programs. Our daughter is reading even more and is extremely motivated to try to read everything, and our son is really starting to come out of his shell with reading. He’s starting to express interest in trying to read little books, which is very exciting! Both children are also making progress in writing, and I find I’m not having to remind them as often to check their pencil grip! I think our son now also fully grasps the importance of writing correctly, which is something he’s resisted simply because it is challenging for him. I think it is a great program for special needs children who have similar struggles. 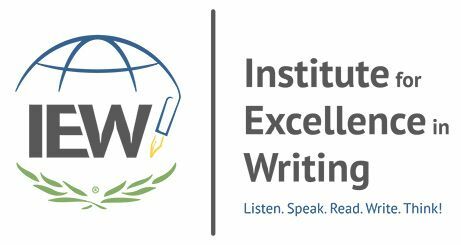 Be sure to connect with the Institute of Excellence in Writing on Facebook, Twitter, Pinterest, Google+, YouTube and Vimeo. Also be sure to check out and follow the IEW Blog! Members of the Schoolhouse Review Crew reviewed a variety of products from the Institute of Excellence in Writing from those with special needs with beginning skills to learners without challenges up to Grade 12! Learn more and check out their reviews by clicking on the banner below! This looks like a great tool. My son is ADHD and has learning disabilties too. He is now 26 years old. Writing was a problem because he couldn’t understand how to space words properly. But after practice, he can at least write somewhat legibly and with few spacing problems. Reading was also a problem until he was 14-15 years old, he basically taught himself to read better and with comprehension by getting online and finding websites about things he was interested in (mainly the news, Nascar, truck pulling and ebay) and reading those things. He will never be a scholar but can at least now read a book to his daughter and for that I am very proud of him! That is wonderful! I love hearing success stories! When you’re in the thick of it sometimes you wonder what the future holds. I’m definitely glad we found a great curriculum that is working well for us, and finding things he enjoys reading is the perfect idea! Your Primary Arts of Language and teaching sounds very interesting. to some of the public schools.